POP rockers McFly have had to postpone next month's 2016 Anthology Tour including three Glasgow dates at O2 Academy until September after Harry Judd required medical treatment. The drummer has an acute disc herniation at C6/7 level and sadly cannot perform this June as he needs treatment and a period of rest. Harry revealed: "I'm absolutely gutted that we've had to postpone the tour. I've honestly tried everything to make it work, but I'd never want to do a tour where I wouldn't be able to give you guys the 110% performance you deserve every night. I'm going to do all the rehab possible to get myself ready to do the most epic shows we've ever put on!" Tom Fletcher said: "Sorry we've had to move the tour. Completely Harry's fault. All complaints to be sent to @mcflyharry. On a more positive note, it gives Danny more time to learn the words to our songs. See you all in September." All original tickets will be valid for the rescheduled corresponding shows - so if you're attending Show 2 (tracks from 'Wonderland' and 'Motion in the Ocean') in Glasgow your ticket is valid for Show 2 in Glasgow for the rescheduled date. For any issues or enquires please contact your point of purchase. Last month McFly announced a 2016 UK tour, playing up close and personal at historic rock venues across Glasgow, London, Birmingham and Manchester. 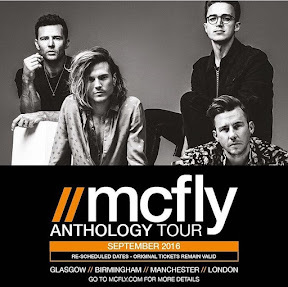 The Anthology Tour is a unique concept; the band will play three nights in each city, with each concert featuring a different set list from a different McFly album, alongside some of the band's biggest hits. The first night in each city will feature songs from 'Room on The Third Floor', the second night songs from 'Wonderland' and 'Motion In The Ocean', whilst the third night will feature songs from 'Radio:ACTIVE' and 'Above The Noise'. These extra special shows, now scheduled for September, are a unique opportunity to see McFly perform almost all of their amazing back catalogue, from album tracks to bonafide smash hits, ensuring every fan will hear at least one of their favourite Mcfly songs.